Do Vermont's TV and radio meteorologists believe in global warming? 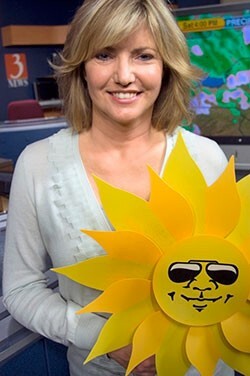 WCAX meteorologist Sharon Meyer is no climate-change denier, but she isn’t sure humans should get all the blame for global warming. The Channel 3 weathercaster says, “There are many pieces to that puzzle, some of which are not manmade. She’s not advocating doing nothing about air pollution. But Meyer is wary of science that says the case for human-caused climate change is a slam dunk. She’s not alone in her skepticism. A recent survey conducted by George Mason University and the University of Texas at Austin, revealed that large numbers of TV weathercasters around the county harbor doubts about widely accepted climate-change theories. Of the 571 forecasters surveyed, a third think global warming is mostly caused by human activities, while two-thirds believe natural changes in the environment play a greater role. Local TV and radio forecasters aren’t climatologists, of course, and most, like Meyer, readily admit to lacking the expertise they would need to speak knowledgeably on global warming. Still, these are the main conduits of weather-related information to the public, and some of the most trusted. The New York Times recently cited a study by Yale University and George Mason University that found 56 percent of Americans trust weathercasters to inform them about global warming far more than they trust politicians. Do Vermont’s forecasters think the burning of fossil fuels is responsible for our rapidly heating planet? Are they influencing their watchers or listeners one way or the other? Seven Days was curious, so we asked a handful of local weathercasters about their beliefs on global warming. Results varied. While the pair of television meteorologists we spoke with emphasized the uncertainty of climate-change science, two radio forecasters said the evidence for human-made warming is undeniable. One of Vermont’s most watched weathercasters, WPTZ Channel 5 meteorologist Tom Messner, was not available for comment. None of the forecasters we interviewed reported taking the universities’ survey, which was sent via the web to all broadcast TV members of the American Meteorological Society and the National Weather Association. But they do have opinions. Meyer says she is often asked about global warming but never talks about it on air because she wasn’t schooled in climatology. “I’m happy if we can get the seven-day forecast right, never mind what’s happening in the next 50 to 100 years,” she says. Only about a third of the weathercasters surveyed by George Mason and the University of Texas said they discuss climate change during forecasts; most abstain for lack of time. At Vermont’s social gatherings and in the local media, of course, weather and climate change are favorite topics of conversation. But the national pattern holds true here: Rarely are the two discussed together during on-air forecasts. Chief meteorologists at two local television stations say they never bring up climate change, primarily because they lack expertise and certainty in those matters. Jason Caterina, chief meteorologist at Fox 44, says he’s not persuaded global warming is happening — or, if it is, that human activities are responsible. Caterina is a self-described “weather geek” who started his career reporting ski conditions for Snocountry Mountain Reports. He admits that climatology isn’t his specialty and says he never discusses climate change on the air because he doesn’t see it as relevant. “In the world of broadcast meteorology, climatology just doesn’t really fit in,” he says. WCAX’s Meyer puts herself in the “open-minded” category. Even if she felt certain and well-versed in climate change, Meyer says, she would be loath to bring up such a politically charged subject on air. “It’s just so loaded out there, that I don’t want to get into the fray,” she says. Radio forecaster Roger Hill, by contrast, is a die-hard believer — and isn’t afraid to broadcast that. Hill is the forecaster for the Radio Vermont Group, which includes stations WDEV in Waterbury, WLVB in Morrisville and WCVT in Stowe. He says there’s “no doubt” climate change is real and is caused by humans. Hill’s forecasts mostly stick to weather. But once a week, he broadcasts a segment he refers to as “Global Warming Thursday,” where he reads climate news and tidbits about weird weather trends — often with a local hook. One recent segment noted that this year’s “ice out” on Joe’s Pond in West Danville — the day the pond thaws and a flag-adorned cinderblock plunges through — was the earliest on record, beating the previous record by 11 days. Hill didn’t study meteorology in school but learned “on the job,” he says; he worked for the National Weather Service for 12 years and studied Earth science on his own. Hill says he’s caught heat for his climate-themed segments, but predicts time will vindicate him. One thing Hill and the TV weathercasters agree on: Climate change has been politicized to a toxic degree. “Al Gore should have never gotten involved,” Hill says. Meteorologist Steve Maleski, one of the voices on Vermont Public Radio’s “Eye on the Sky” weather updates, says he’s surprised and “somewhat dismayed” to hear that so many TV weathercasters nationally doubt global warming science. Maleski says he and colleagues Mark Breen and Chris Bouchard don’t stray into climate change on air because they’re strictly focused on weather. Nolan Atkins, who chairs the Department of Atmospheric Sciences at Lyndon State College, says he understands why meteorologists steer clear of global warming, especially when they’re not trained experts. But he also says weathercasters do viewers a disservice by not educating themselves on the latest science and incorporating it into their forecasts. Students at Lyndon State learn about climate change science during their freshman year in Atkins’ Survey of Meteorology course. Two decades ago, he notes, when many of today’s forecasters were educated, meteorology programs didn’t cover air pollution, climate change or environmental impact, as today’s programs do. For her part, Meyer is sticking to what she knows best and what she believes viewers want: just the weather.